PURPOSE BUILT APNEA DIVING FINS FOR FREEDIVING AND SPEARFISHING. 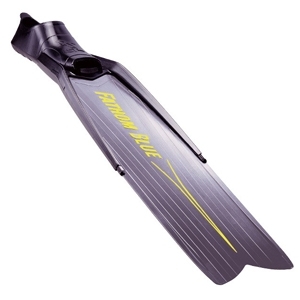 THE COMFORTABLE FOOT POCKET AND POWERFUL BLADE PROVIDE EFFICIENT THRUST AND UNPARALLELED UNDERWATER MANOEUVRABILITY. Although more expensive, rubber is our chosen material to make Fathom Blue’s foot pocket. It might seem a bit old fashioned but at the end of the day, it is all about performance. We were able to strategically build a rubber foot pocket with multiple flexibility / hardness while fins made from various plastic compounds do not share the same advantage. 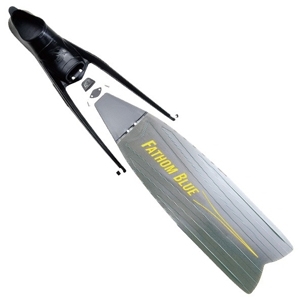 This means Fathom Blue's foot pocket is able to produce a spring-like effect when finning, yet its base (sole) is rigid and efficient.